Today I wanted to make a card for the challenge at Simplicity - One Layer Wednesday Challenge #90 - Dudes Rule (make a one layer masculine card). One layer cards are definitely a challenge for me ... but I think I'm getting the hang of it. I have learned so much recently from participating in the Featured Stamper Challenge at SCS ... two of the recent featured stampers are experts at one layer cards (Heather Telford, Susan Bridgman). I have learned a lot from looking through their galleries on SCS. I stamped the image in Stazon Black and then colored in the scene with my Stampin' Write markers and a blender pen. I masked around the outline and then sponged Baja Breeze for the sky. I stamped the sentiment using the Stamp-a-ma-jig for positioning. What a perfect summer day! Love your cards. Beautiful and I love that stamp! Loll, this is a gorgeous beach scene and a great use of the throwdown colors! So glad to see you play along with us again! This is lovely - so relaxing! Loll, I'd say you're sorta getting the hang of it. It could use a lot of work, however. NOT! Leave it to you to make a one layer card look like it has several layers and texture and artistic coloring ... aah! Simply lovely piece of art! I LOVE this!!! So peaceful looking...I think I want to be there!! LOL! Great use of the colors...I'd love for you to link up with me at 52 Card Pickup this week! Wow Loll, Your card is awesome! 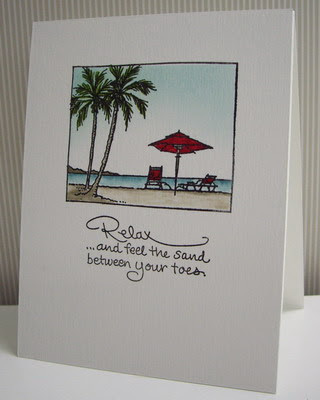 Beautiful watercoloring, and such a great sentiment! Thanks for playing along with the OLW challenge last week! Loll, your one layer and CAS cards are so nice. Whether on your blog or your SCS gallery, I always enjoy taking a look *smiling*. I agree with Anonymous, "You've Got Talent!" WOW! This is perfect! Reminds me of my trip to Hawaii!! !